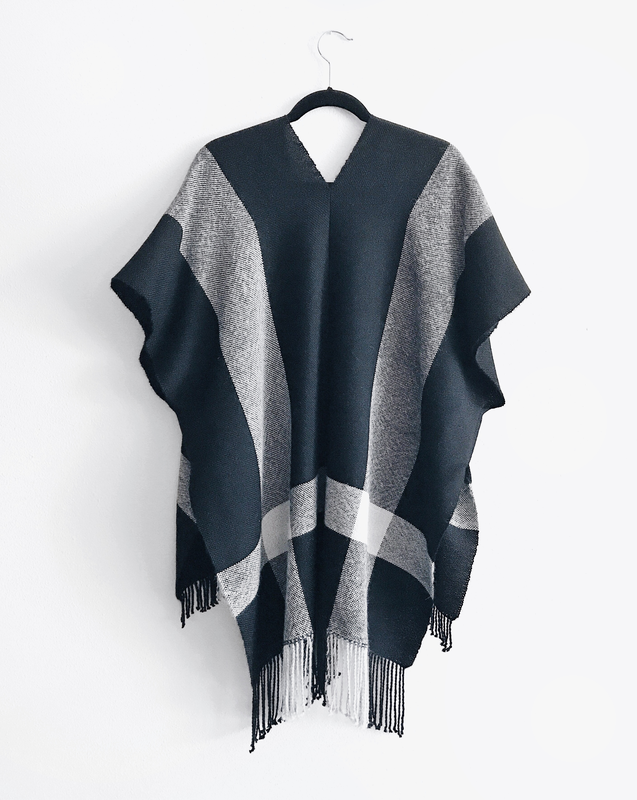 Autumn is here and we cant wait to get wrapped up in this cozy alpaca poncho by Andrea Carpenter. 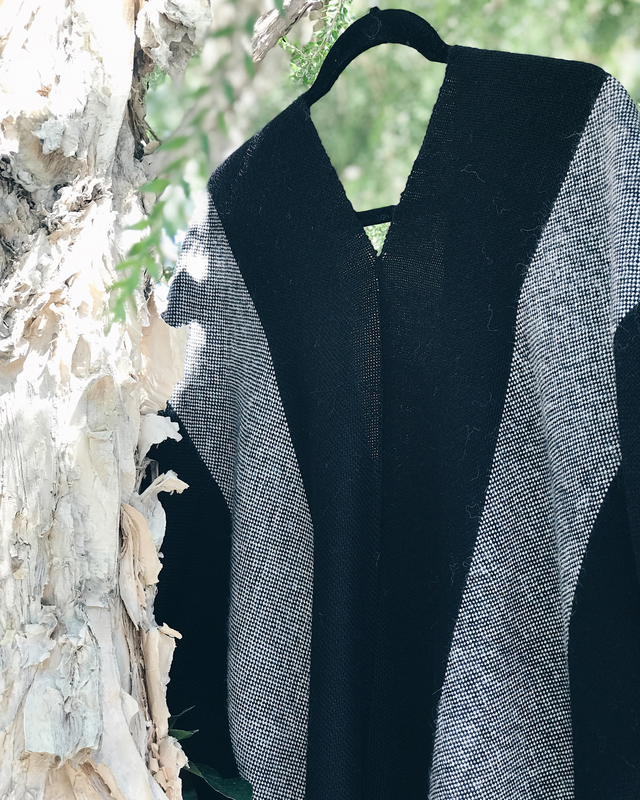 Using three cones of our 3/10 Alpaca Weaving Yarn, Andrea designed this simple garment that is constructed by seaming together two handwoven scarves. We love the versatility of this project! 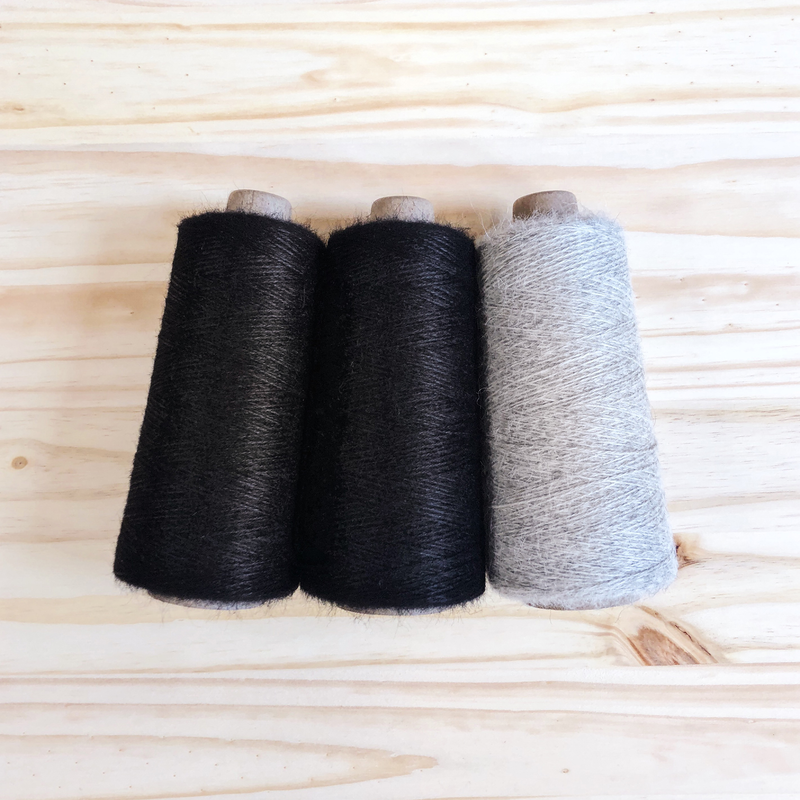 Depending on your desired outcome, you can weave the two scarves and leave them as is, or turn them into a simple poncho with the help of the instructions below. 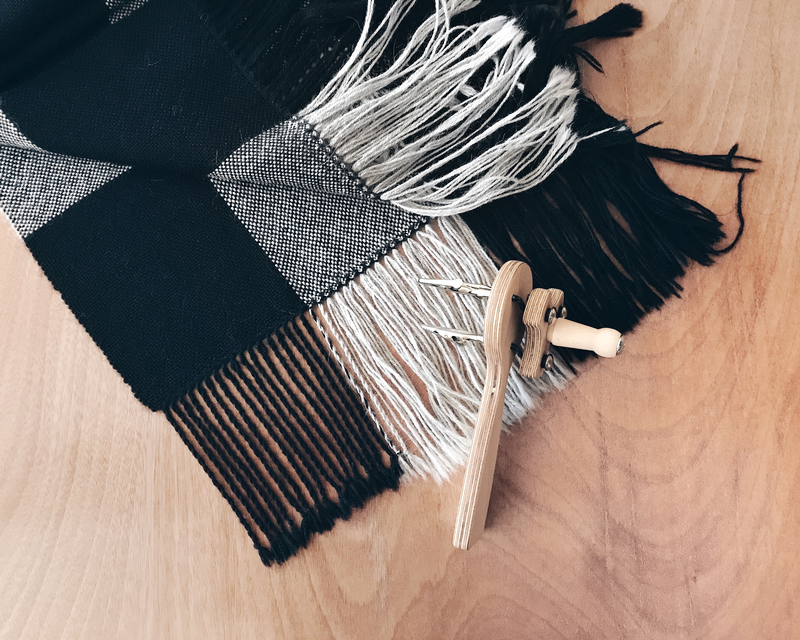 To weave two color blocked scarves similar to Andrea's, follow the warp & weft color order below. Weft Color Order: Weave the following pattern for both panels. Begin and end each panel with hem stitch (tutorial here) and make sure to leave plenty of room for fringe. 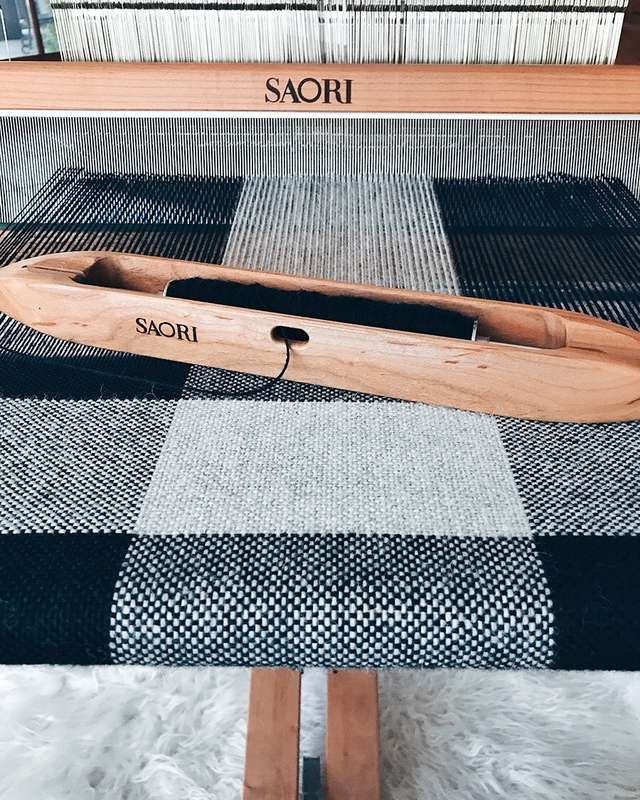 TIP: Measure the length of your stripes when the loom is not under tension for the most accurate measurement. 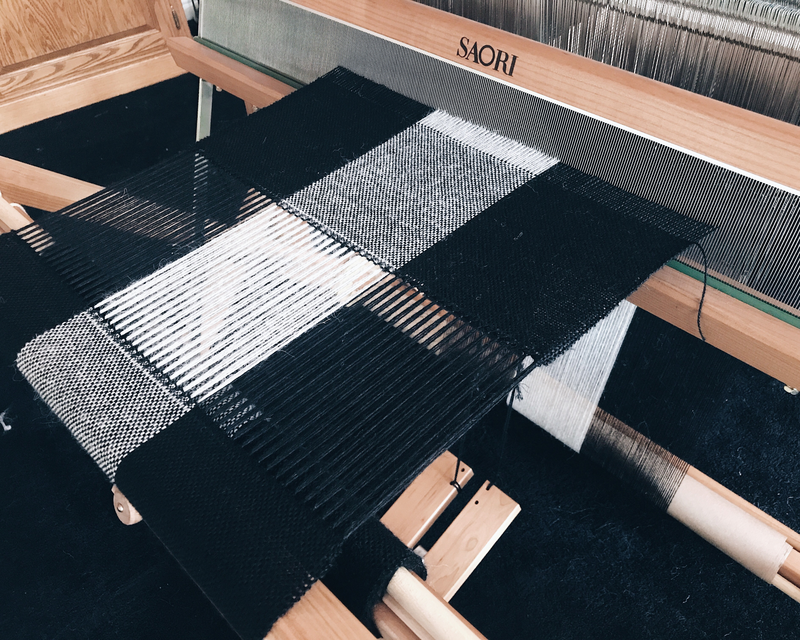 Andrea writes, "When the panels are complete and off the loom, wash them both in cool water and mild soap. I used a wool wash, but any mild soap will do in a bind. I then wrung out the excess water, rolled the panels up in a towel to absorb even more excess water. I then ironed them on the wool setting while they were still slightly damp. Ironing can lengthen and/or widen the fabric so make sure to line up the panels from time to time to make sure they are the same length and width. If desired, you may use a fringe twister to create tassels at the ends of each panel as I did. I kept the back tassels longer than the front to give it even more of a pronounced asymmetrical look (2" fringe in the front and 5" fringe in the back). This step took quite a long time so make sure you have a good show to watch on Netflix or listen to the Weave podcast!" 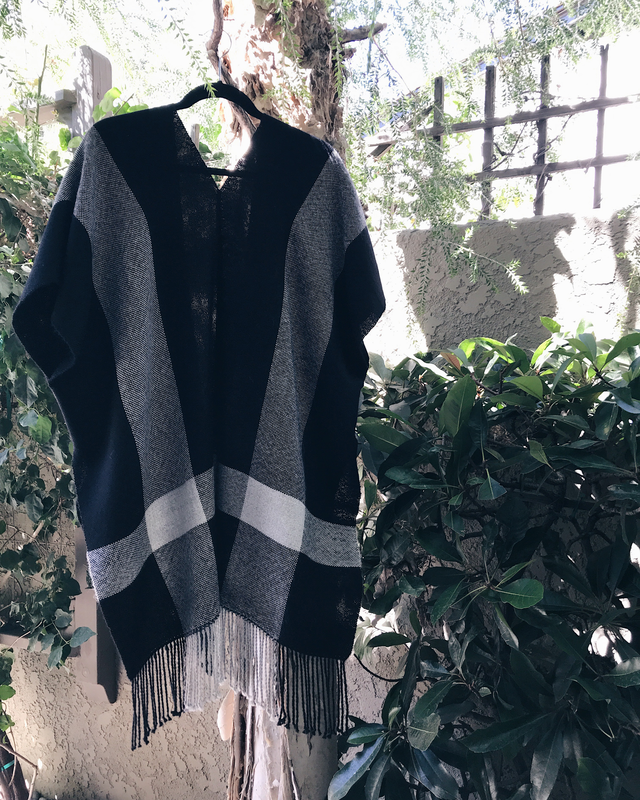 After washing, ironing and finishing your fringe, follow these steps to sew your weaving into a simple poncho. Line up your panels one on top of the other and begin pinning them together starting at the bottom and up one side lengthwise for about 27". Once sewn, this will be the back of your poncho. Sew with a simple straight stitch and 1/4"-1/2" seam allowance along the edge for approximately 27". Andrea writes, "I wanted the jacket to be longer in the back and shorter in the front, which is what determined the length I sewed the panels together in the back. I suggest pinning the panels together and trying it on before sewing to determine where you want the jacket to fall on you. Adjust the pins accordingly and that will give you an idea of how much to sew the two panels together." If you want to create arm holes, try on the poncho and pin the front and back panels together to get a feel for where you would like the arm holes to fall. Measure to make sure the holes will be in the same place on each side. Sew a 4" seam on each side with a straight stitch and a 1/4"-1/2" seam allowance. 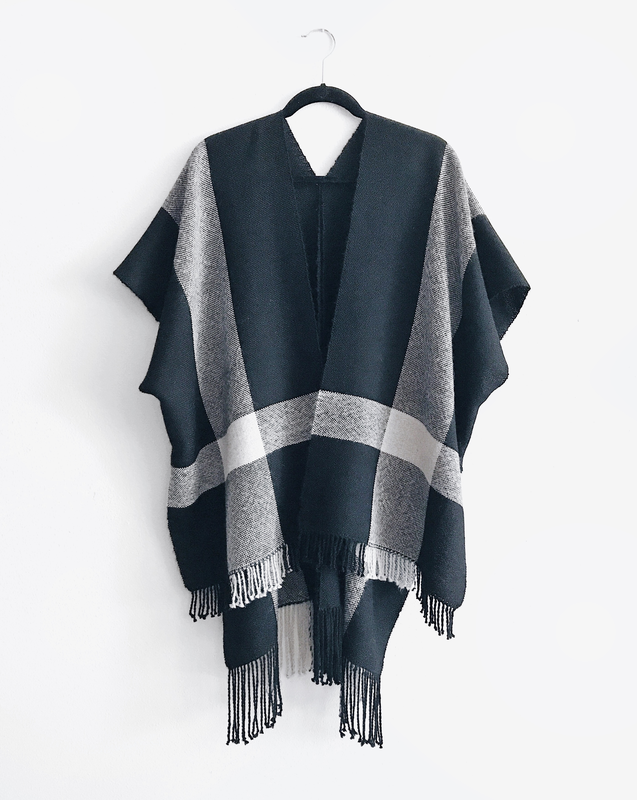 Hi Claudia, we are publishing a poncho pattern this Friday with plant-based fibers – check back soon, I think you’ll love it! I would love to make this on my RH loom, but am concerned about using alpaca. I am very allergic to wool, so even though alpaca feels fine at the store I don’t know if I could wear it. Can you suggest it in other fibers? I have completed weaving this poncho using my 4 shaft loom. I was a little dubious that I would have enough yarn and was pleasantly surprised that I had plenty left over even though I added extra length to the warp to accommodate the loom take up. I love it and will purchase additional kits in the future. Hi Joyce! Yes, that’s the total for both scarves. This yarn is pretty thin so I find that the full warp does work on a rigid heddle loom. But you could also warp both scarves separately if you prefer. My question is about warp length, listed as 5.5 yards. So is that the total for 2 scarves?We warp half that length for each scarf I assume? Hi Marilyn! Bleeding sometimes happen with very dark colors the first few times you wash. 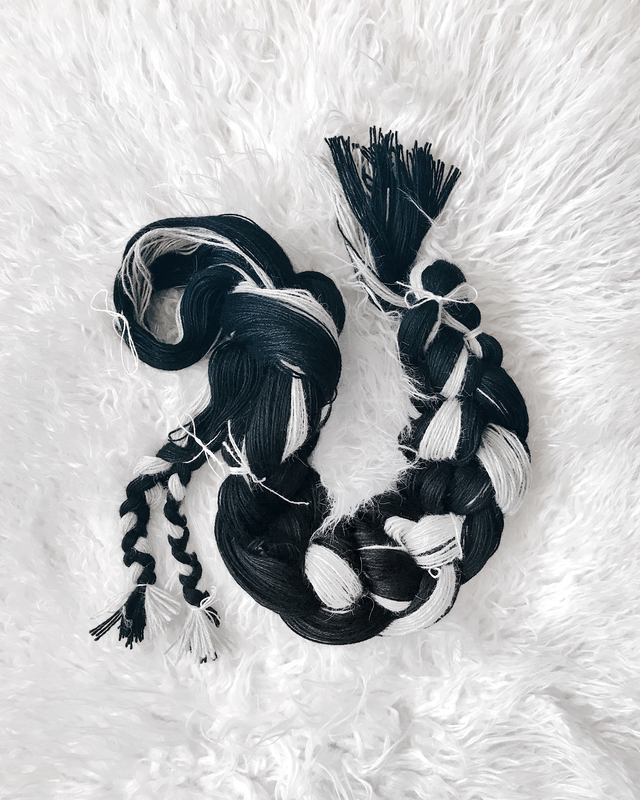 The dyes used in this alpaca are high quality, but sometimes they are oversaturated and need some extra rinsing after weaving. 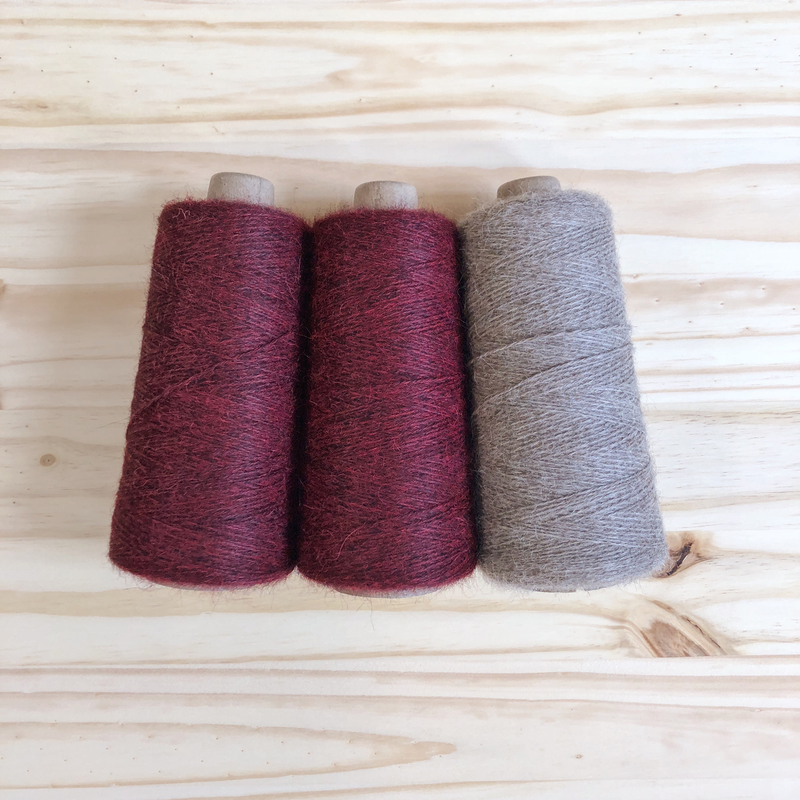 Handwoven Magazine has a great writeup about how to wash things to address bleeding issues. 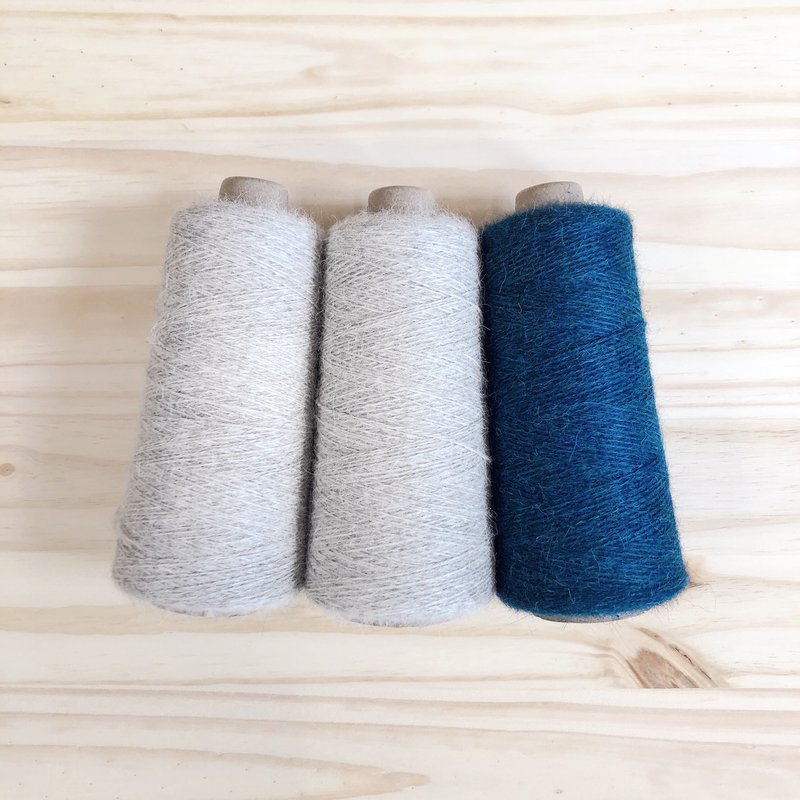 https://www.interweave.com/article/weaving/running-colors/ In this particular piece she’s talking about cotton, but the advice is still good – to hand wash and rinse in room temperature /cold water until the water runs clear, then dry with with a towel. The editor of the magazine recommends drying it with an iron for cotton, but I wouldn’t necessarily do that with alpaca – I would get it pretty dry with the towel and then lay flat to dry. I hope that helps – please let me know if you have any more questions! This fiber is exceptionally nice. I had no broken threads and my edges were great. It fulled nicely but I would skip that next time as my fringe didn’t like it. I had plenty of warp length and wished I could have added five or more inches for the center section of each panel/scarf.